Are you looking for a quality cake or pavlova for that special occasion? Look no further than our delicious cakes. 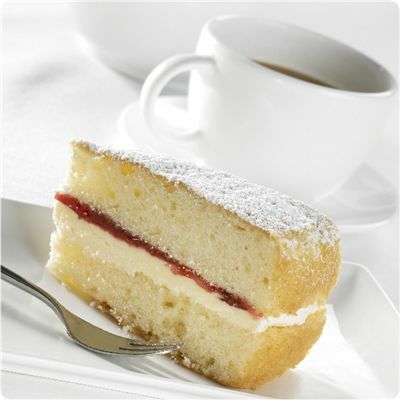 Our cakes are just like the ones served in quality coffee shops and restaurants. The ingredients are of the highest quality, and the taste is second to none. Why give yourself the effort of having to order a cake from another supplier, then having to go and collect it yourself? Why not have it delivered with your buffet, ready to serve? 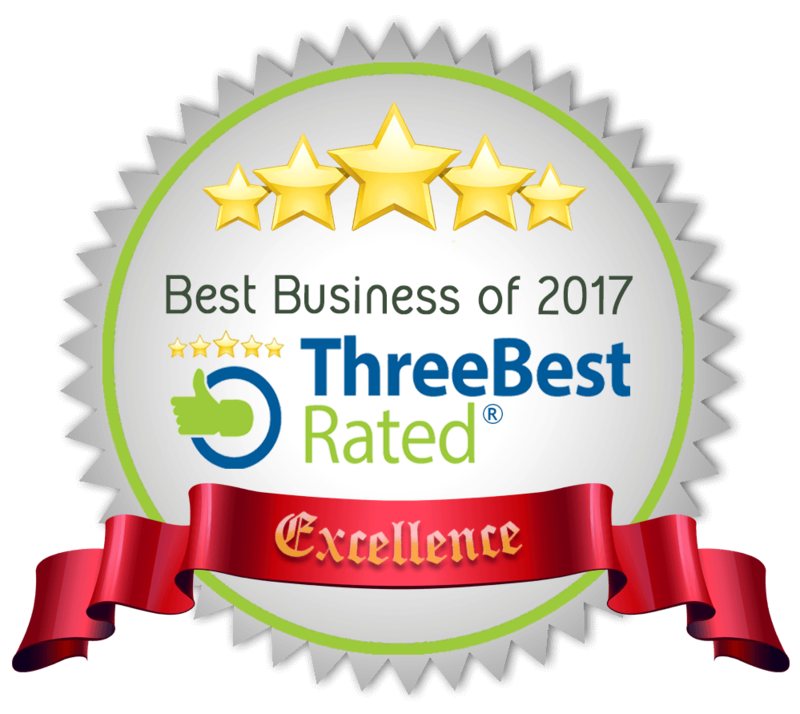 We promise you won’t be disappointed! These are the large cakes that we can serve with our afternoon tea. The cost of the cake is already built into the afternoon tea. A soft, coffee sponge topped and filled with coffee fudge icing, finished with pieces of walnut. An incredibly rich, lush cake packed with chocolate, covered and filled with a rich chocolate ganache and sprinkled with chocolate flakes – definitely one for the grown-ups! A moist orange sponge with sticky orange curd, smothered with rich chocolate ganache, finished with a zig zag of orange icing. A light, buttery lemon sponge drizzled with a zingy lemon syrup and topped with icing. A moist sponge made with (they don't taste of courgettes, they just make the cake delicious), drizzled with lime, filled with a lemon and lime curd and decorated with a soft cheese and lime icing. Finished with chopped pistachios on top. Really fresh, naturally moist from the courgettes but zingy as well. 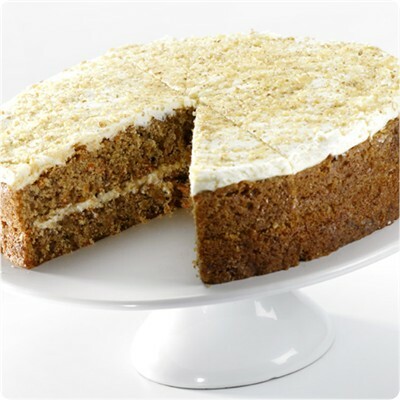 A moist, gluten free carrot cake made with pineapple, carrots and coconut, with a great combination of mixed spices. 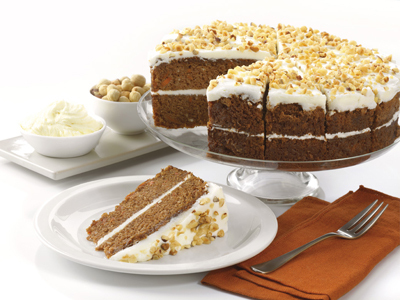 Filled with cream cheese frosting and finished with chopped hazelnuts. 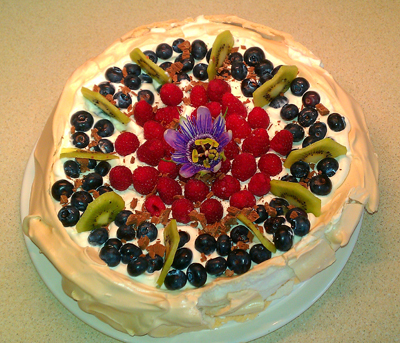 For that REALLY special occasion or person – a handmade, quality pavlova with a crispy outside and slightly chewy centre, just the way good pavlovas should be. This little beauty is 12 – 13” across, filled with fresh, whipped cream, and generously decorated with fresh fruit and sprinkled with grated chocolate. Disposable plates, forks and serviettes included. Our cakes are served on a cake board and are already sliced for your convenience (except for pavlovas). They all supplied with quality disposable plates and napkins. If you would like a cake that is not listed here, please don’t hesitate to phone us – we can probably do it!